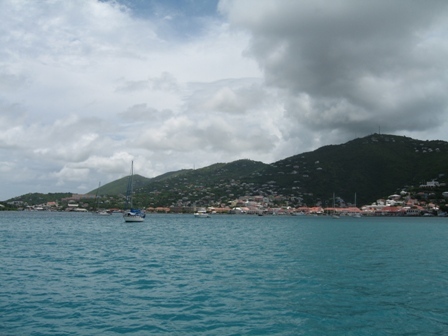 Leaving the BVI's, Marco and I headed for St. Croix which is one of the US Virgin Islands. It was a nice day sail of 40 miles, south of BVI. We had not intended to visit St. Croix initially, but Ed from Cinnabar had suggested for us to check into whether Marco could take his orthopedic recertification exam there since it is a US territory. Sure enough he could, so off we headed to St. Croix. This saved us a trip of flying back to the states. 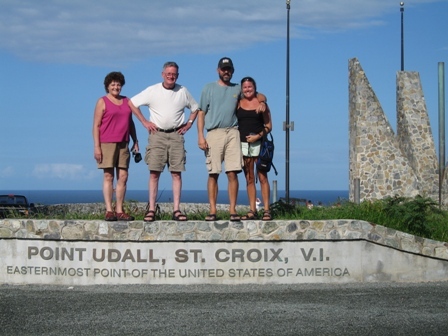 Once we realized we were going to St. Croix, Mom and Dad soon called and wanted to meet us there and sail the USVI's with us. We couldn't wait for them to get here!! Denmark was a latecomer in the race for colonies in the New World. Seeking islands on which to cultivate sugar as well as an outlet for trade, the Danish West India & Guinea Company, which was a group of nobles and merchants chartered by the Crown, took possession of St. Thomas in 1672 and its neighbor St. John in 1717. Because neither island was well suited to agriculture, the company in 1733 purchased St. Croix from France, which was larger, flatter and a more fertile island. Colonization of St. Croix began the next year, after troops put down a slave revolt in St. John. For their first settlement the Danes chose a good harbor on the northeast coast and named the adjacent town Christiansted in honor of the reigning King Christian VI. In order to attract settlers the island was surveyed into 150 acre plantations (about 375 plantations total) that were reasonably priced. The best pieces of land soon came under cultivation and dozens of sugar factories began operating. The population on St. Croix soon approached 10,000 with nearly 9,000 of them slaves that were imported from West Africa to work the sugar fields. 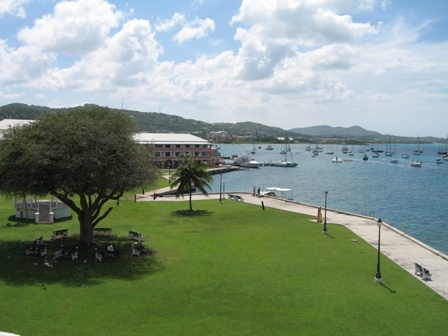 After 1775, St. Croix began a long period of growth from the sugar cane industry and was called the capital of the "Danish Islands in America". 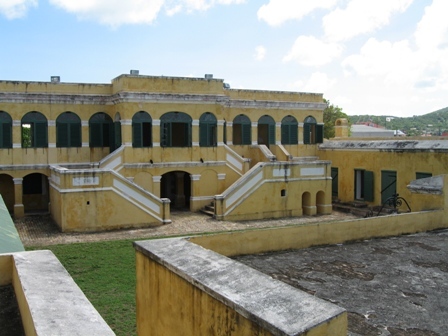 This attracted many royal governors who also took up residency in St. Croix at Christiansted. For the next century and a half, the town's fortunes were tied to St. Croix's sugar industry. Between 1760 and 1820 the economy boomed. Population rose dramatically, in part due to the free trade policies and being a neutral island, which attracted settlers from other islands. This is what provided a sense of British culture on this Danish Island that has a French name. Exports of sugar and rum soon soared, sugar prices were high and labor was cheap. Many of the islands planters, merchants, and traders soon became very prosperous which you can still see evidence of in the remarkable architecture around town. However, like so many of the other islands we have visited, the golden age of sugar cane was eclipsed in a few decades when the rise in the beet sugar industry took place in Europe and North America. St. Croix was also affected by drought, hurricanes, and the rising cost of labor after slavery was abolished in 1848, all of these factors contributed to St. Croix's economic decline. The United States purchased the Danish West Indies in 1917 for the islands strategic harbors and not for the agriculture opportunities. 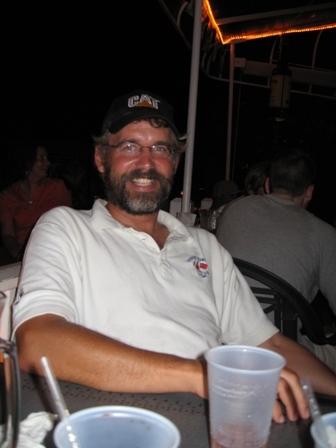 Here Marco is celebrating with a Blackbeard's Ale at the Virgin Islands Brewing Co. after finishing the four hour orthopedic recertification exam. Unfortunately he won't find out the results until September but we all know he did well!!! A day after Marco finished the exam Mom and Dad came to sail with us again, this time the USVI's. Here we are again at the same brew company where Marco and Dad tried one of each flavor. We became regulars here, not only did they have great beer the buffalo wings were fantastic, something I had been craving for awhile. 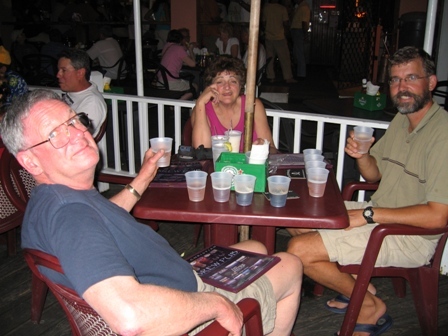 We also met another really nice cruising couple, Connie and David, Connie was a waitress at the brew pub. Connie actually drove me to the airport to pick up Mom and Dad. Thanks Connie!! The day after Mom and Dad arrived Dad and I decided to take a tour of Fort Christiansvaern, while Mom sun bathed. 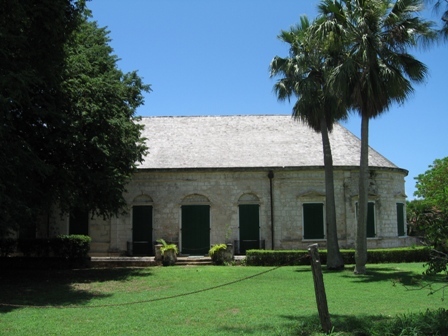 This fort was built in 1749, with additions made in 1835-41. It protected the town from pirates, privateers, and slave uprisings. After 1878 it became a police station and a courthouse. Today it is a museum that contains some military exhibits. 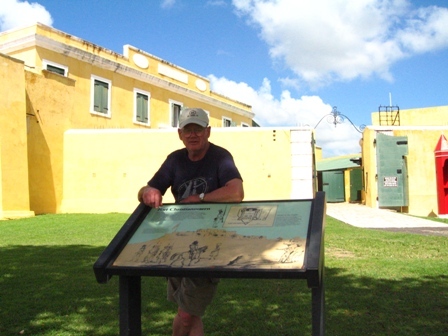 Dad taking in the historical facts. 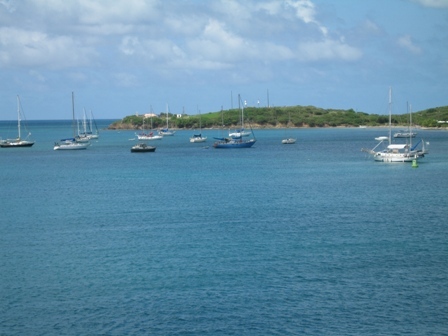 The four of us decided to rent a car and drive around the island, which is the largest of the USVI, twice the size of St. Thomas and is 28 miles long and 7 miles at its widest point. The island is close to a desert on the east end and almost a rainforest in the west. 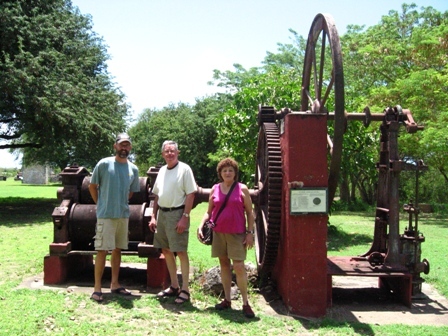 One of our first stops was at Whim Museum, a restored sugar plantation. The estate on the Whim plantation. Making Muscavado, or raw sugar was easy, just very hot and smelly. They would start by boiling the raw juice from the sugar cane in kettles or "coppers". As the juice boiled two things would happen, the sugar content increased and the impurities would rise to the surface as scum. The sugar boiler, a skilled and valuable slave, had to know when to move the hot syrup from one copper to the next. He also had to remove the scum without taking too much syrup with it. Each copper was smaller and hotter than the previous one. The boiling process continued from 12-14 hours a day because the juice had to start boiling within 20 minutes of crushing or it went sour and fermented. The canes also had to be crushed within 24 hours of cutting for the same reason. 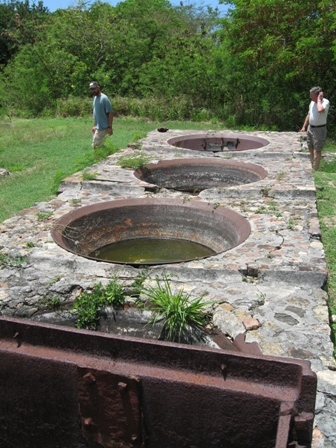 3 Coppers that were used in making sugar and rum at the Whim Plantation. After the syrup had been passed to the last copper, called a Teache or striking copper, the boiling sugar filled liquid was "struck" or transferred to the cooling pans where it was cooled and the sugar would then crystallize. The crystallized sugar was then removed from the wooden cooling pans and packed into conical clay sugar molds, during the 18th century, and into large barrels called hogheads during the 19th century. The liquid that remained after this process was molasses and was used to make rum along with the scum that was produced earlier in the sugar making process. Sugar cane is a very tough fibrous material similar to bamboo. 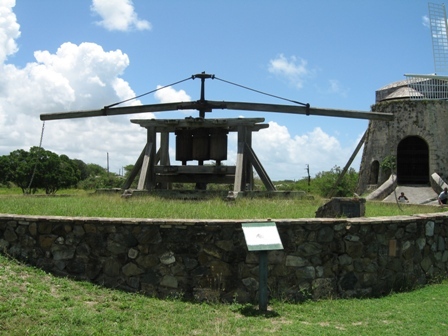 The earliest commercial way to crush the cane for commercial production of sugar was with an animal mill with its roller acting as a wheel and rolling over the canes. This was replaced by 1550 with animal mills of the form you see here. Two to four horses, bullocks or oxen would walk around in a circle while they were attached at the end of the arms. This would turn the central roller and the two outside rollers that were geared to the center one. A slave would stand on one side of the mill and take cane stalks from a pile brought by a donkey cart and feed the stalks in-between the center roller and the outside roller that was turning away from him. This would break down the canes structure. Then another slave, who would stand on the other side of the mill, would guide the crushed canes back between the central roller and the other outside roller, where the juice would be pressed out of the cane. 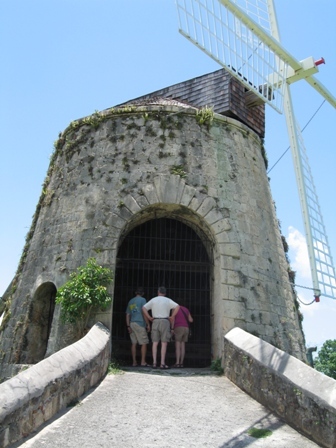 This windmill is one of more than 150 that were built on St. Croix between 1740 and 1829. The shape indicates that the design came from England. 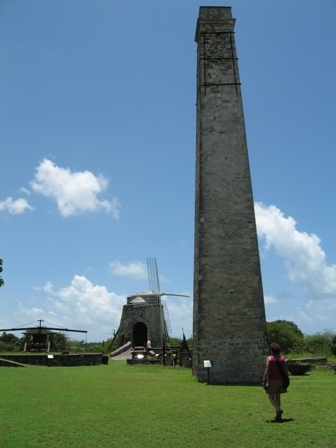 This windmill was possibly built by a team of skilled slaves that were trained in windmill building. This team of slaves probably moved from plantation to plantation and maybe island to island building mills. The windmills replaced the animal mills that were shown above. This is a picture of a Steam Engine and Cane Mill that replaced the windmill at Whim Plantation in 1847. Very few of these engines were ever made because the design placed the heavy moving parts in a dangerous and impractical place, above the workers' head. The steam engine ran on what was considered high pressure back then, 40-60 psi and its 10x14 inch cylinder allowed the engine to develop around 15 Horsepower or about 12Kw. It could crush 10-20 tons of cane in a 12-14 hour day. 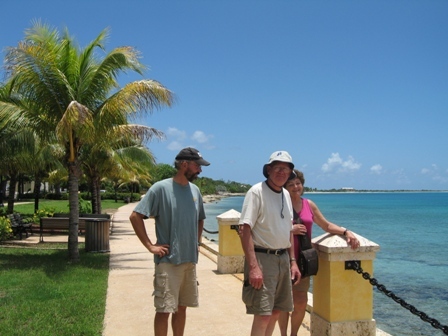 From The Whim Plantation we headed to check out the second largest town on St. Croix, Frederiksted. When we arrived the streets were very quiet and no one appeared to be out and about. It happens that the town doesn't really "open" unless there are cruise ships in the harbor. It was also a national holiday the day that we visited to add to the feeling of the town being empty. We did happen to find a little place and had a quick bite of rotie's, which are a curried filled pastry of chicken, shrimp, potatoes or beef. Mom and Dad enjoyed them in Bequia so it was nice to have them again. 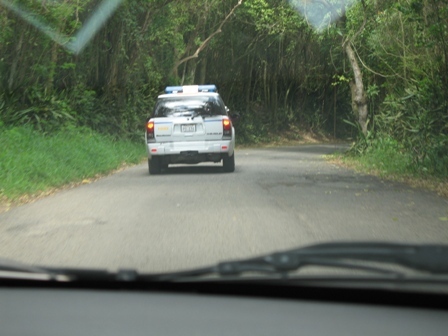 A picture of a police cruiser escorting us out of the rainforest. Our next stop was to drive through the "rainforest". It can not be officially called a rainforest because the area would need a couple of more inches of rain more each year but it was pretty close. In St. Croix they still drive on the left hand side of the road and as Marco was driving he kept saying, "keep to the left". Mom noticed that Marco was no longer saying it out loud and commented this to Marco. Marco said, "I may not be saying it out loud by I am still saying it to myself". He did a great job driving though. Once we were deep into the rainforest the environment began to change. There were "homes" with big signs stating apocalyptic sayings and the area seemed a little run down. Out of no where, when we were deciding if we should take a left or a right, a police cruiser pulled up next to us and asked us if we needed help? We told him we were a little lost and he recommended us to follow him out because, "this is no place to be lost". We later asked the car rental women what was the matter with driving in the mountains and she told us that that is were the bad guys bury the bodies. We don't know if that is indeed the case but we nevertheless were glad that we made it out safely. Thanks Mr. Policeman!! Here we are at the easternmost point of the United States of America. We were once playing Trivial Pursuit though and one of the cards stated that Alaska was the easternmost part of the US, because it crosses the date line at the junction of 180 degrees east and west longitude. Either way it was a nice place to stop with beautiful views of the Caribbean Sea. Another side note of interest, Alaska is also the most western and northern state in the US and Hawaii the most southern. So next time you play Trivial Pursuit you will get that answer right. The next day we decided to sail over to Buck Island (my Dad's namesake) and spend a night or two. It was a nice 5 nm or so sail over. 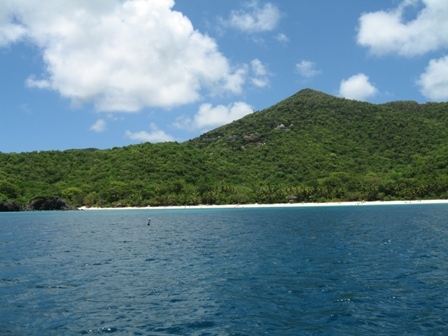 Buck Island is 6,000 ft. long and a half mile wide, 328 ft. high and uninhabited. 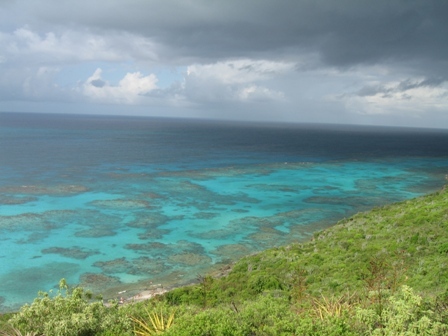 The northwestern side of the island was made into a National Monument in 1961 but was first put under protective status in 1948, "to preserve one of the finest marine gardens in the Caribbean Sea." This park is one of the few fully protected marine areas in the National Park System. Some of the endangered and threatened species that live here are; least tern, brown pelican, hawksbill, leatherback and green sea turtles. We dropped anchor in the designated anchoring area and ended up having the island to ourselves for 2 nights. 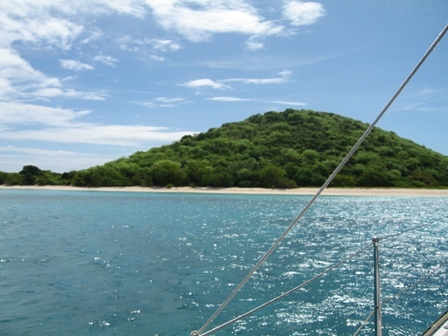 Buck Island has a gorgeous beach on one side of the island and a snorkeling trail on the other. The trail has quite a few underwater signs that guide you through the reef and identify what you are seeing along the way. The four of us hopped into the dingy and explored the reef the second day we were there. It was a truly amazing site to see. The Elkhorn coral, which resembled haystacks, were scattered along the outside of the forereef and rose nearly to the water's surface from the seabed some 40 ft. below. We also saw the biggest barracudas that we had seen so far, a reef shark, blue tangs, turtles, star coral, brain coral and much more. The water was very calm since we were snorkeling on the leeward side of the reef. Fun was had by all. Some of the sites seen along the trail as Mom, Dad and I hiked to the top of Buck Island. The reef seen from the viewpoint at the top of Buck Island. Mom, Dad and I took a hike to the top of Buck Island and got there only a few minutes before an amazing rain storm moved over us. Being very hot from the walk it was a welcome to have the cool rain drench us. Our only concern was walking back down the trail with water dripping down off the Manchioneel Trees. 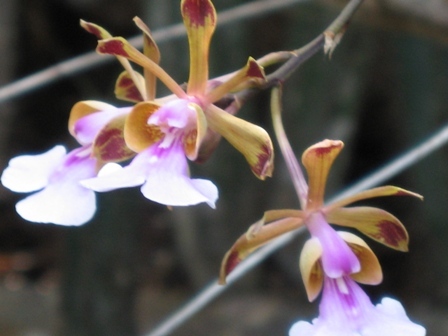 These tropical plants can produce a severe skin reaction when you touch them or are under them when it rains. So coming down the hill we booked!! Once we were on the beach we soaped up with baby shampoo and dove into the sea. (Baby shampoo and Joy dish detergent are some of the only soaps that actually produce suds in salt water). 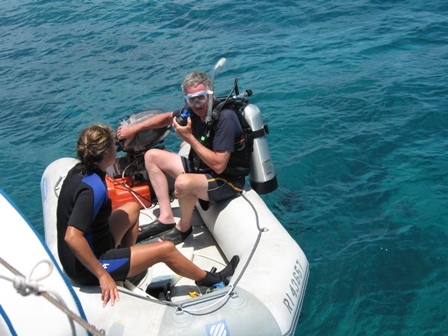 Another interesting fact we learned from "Big Mike" on Saba Island was that baby shampoo is great for washing out your mask before snorkeling or diving because is stops it from fogging up. This is much better than spitting into your mask we decided so we always keep a bottle handy!! Mom and I at the top of Buck Island before the rain storm set in. Like our hiking outfits? 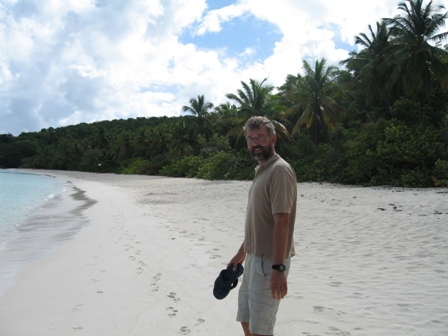 After spending two nights at Buck Island we decided to head to St. John, another of the USVI's, some 40nm away. 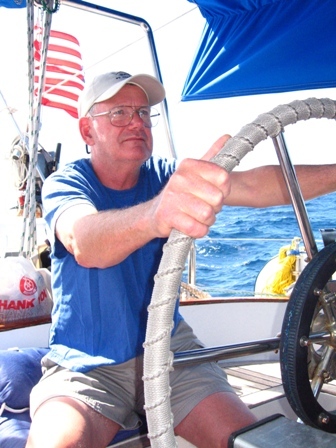 We had a great sail over, a little lumpy, but nice and sunny with good winds. Dad steered most of the way like the pro he is. 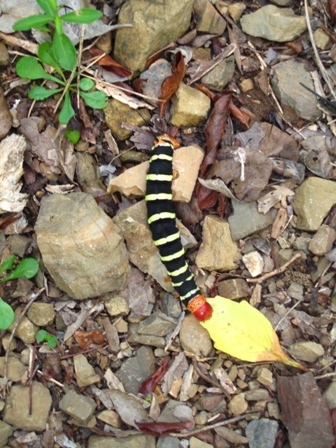 Two thirds of St. John is under control of the National Park Service which allows for the maintenance of its pristine appearance. Here we moved from one beautiful tranquil bay (except for the mosquitoes) to the next. Our days were spent snorkeling, swimming, reading and eating with blue skies above us and crystal clear water below us. It was really nice when Mom and Dad came because Marco and I felt like were also on vacation. We put aside boat chores and relaxed along with them. 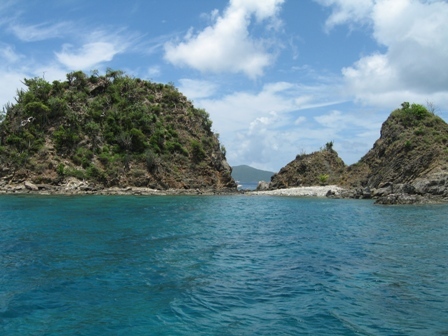 Whistling Cay (pronounced key) off Mary Point was a great place to scuba dive and snorkel. Dad trying out scuba diving again after many years away from the sport. 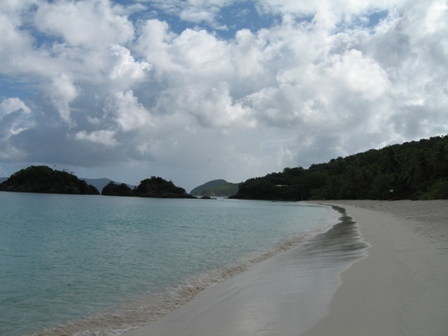 Trunk Bay with another underwater trail posted for snorkelers. 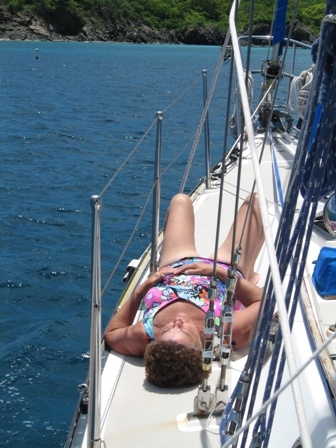 Mom was determined to get back the tan she had achieved in the Grenadines. This time however, with the base tan from the previous visit, she became very dark and the "Indian Princess Blood" she claims she has, came out!! Marco and I taking a stroll along Trunk Bay one morning. 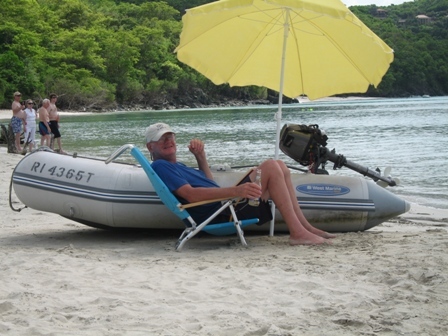 Dad hanging out, having a beer, while Mom and I read on the beach at Trunk Bay. 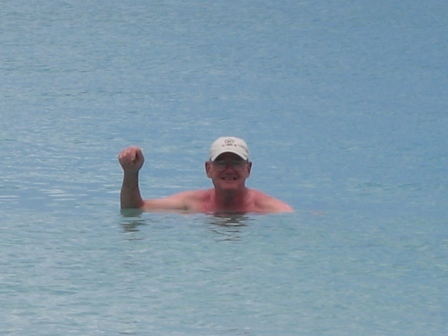 Dad taking a splash to cool down at Trunk Bay. 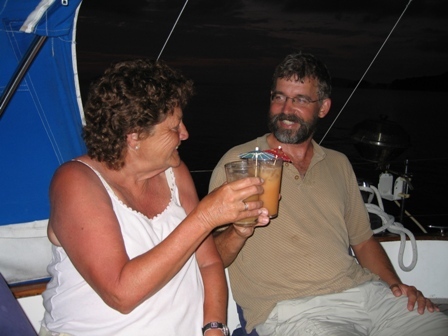 Mom and Marco enjoying fruity rum drinks before dinner aboard Dalliance. After spending about a week on St. John it was time to head to St. Thomas, another of the USVI's, where Mom and Dad would fly out from and Marco and I would leave from to head to the Turks and Caicos Islands. Dad was very excited to see St. Thomas again because he had spent a considerable amount of time here when he was in the navy, some 45 years ago. When we arrived though, he could hardly recognize the place, it had been developed that much. 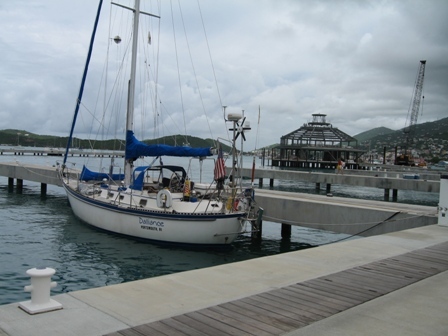 We ended up going to a wonderful marina, Yacht Haven Grande, located in Charlotte Amalie Harbor. The mega-yacht facility only re-opened a few months earlier. The marina was run like a 5 star hotel and as soon a we pulled in there were at least 6 people helping us with our lines. When Marco, Dad and I went to check in, the office staff gave us a welcome bag that contained a hat, tee shirt, magazines and a great tote bag. 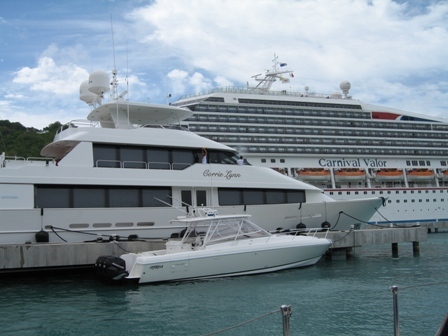 We felt very welcomed and commented to the staff how much we appreciated being treated like a mega-yacht owner. Everyone there was very friendly and extremely accommodating. You would just leave your trash at the end of the finger pier and they would come and pick it up, they offered multiple times to drive us the 100 yards to the office in their golf cart and even called customs for us when it was time to check out of the country. Some of the boats at the Yacht Haven Grande Marina. It was sad to say goodbye to Mom and Dad again but we would get to see them again this fall in RI and Vermont. 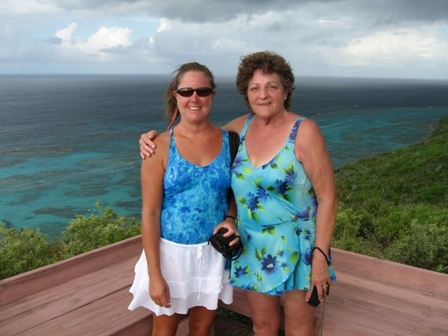 We had just learned, while in St. Thomas, that my sister Wendy and her family that live in England, just bought a house in Vermont and would be moving there in August. This makes going back home to RI a little easier and we are all very excited to live closer to each other once again. Off to the Turks and Caicos!! !